This story was published January 2010. For decades, business and professional women in America have banded together to further social and community goals and to foster good works through social service sororities. 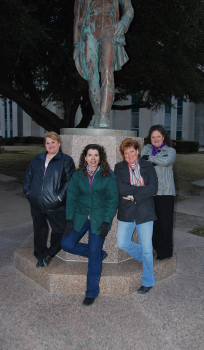 Chi Lambda in Bonham began as a local chapter of the national service sorority Epsilon Sigma Alpha in the 1970s. After a decade of affiliation with the national group, the Bonham chapter spun off as an independent entity with a new name, Chi Lambda, but with the same devotion to serving the people of Bonham and Fannin County. Chi Lambda marked its “Silver” anniversary in 2009, chalking up twenty-five years of interaction with the community with a celebration and renewal of the group’s mission of service. Early on, the members focused efforts on programs for Mental Health and Mental Retardation and volunteer work in nursing homes. The last decade has seen the emphasis shift to children, and Chi Lambda sponsors the Fannin County Special Olympics. Members also work with the “Autumn in Bonham” bike rally, Relay for Life, and other events and activities directed toward helping local children. Audra Andrews, Paulette Andrew, Beverly Berni, Mandi Brooks, Karen Butler, Alice Carruth, Sondra Compton, Stephanie Dennis, Sandy Dobbels, Ashlea Frasier, Michelle Griffin, Jane Hodge, Kenna Hodge, Laura Lackey, Samantha Lumpkins, Brenda Moore, Royce Moss, Leslie Oliver, Barbara Parker, Mary Payne, Lisa Porter, Tammy Rich, Patsy Richardson, Denise Sanderson, Doris Shockley, Sally Simpson, Brenda Sims, Connie Skidmore, Julie Todd, Kelly Trompler, Linda Vaught, Ashley Walker, and Freida Welch.